Have I just returned from Sochi, competing in the giant slalom? I’ve just returned from grocery shopping. 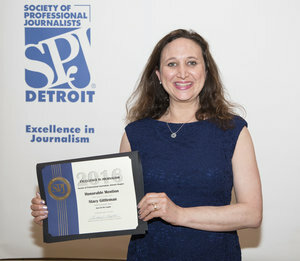 In suburban Detroit. And there is a pothole that could accommodate a baby elephant on the road between my house and the dairy aisle. To say that Michigan’s roads have a pothole problem is an understatement. We don’t really have roads here anymore. Neglect of Michigan’s roads have been decades in the making and it’s more like Michigan has miles of potholes with some bits of road holding them together. At $124, Michigan spends the least amount on roads per person per year than any other state. Yes, we have low taxes, but the cost of maintaining a car on these roads – (an average of $320 per year per motorist) – makes up for the low taxes. 29% of Michigan’s major roads are in poor or mediocre condition. 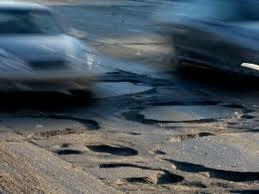 Michigan drivers lose a total of $7.7 billion annually because of deteriorated, traffic congested roads. Cross into neighboring states dealing with the same rough winters the roads are much better. That’s because Ohio invests in its roads $234 per motorist and in Wisconsin, $231 per motorist. In these states, politicians did the right thing and raised taxes to fix their roads. Now, in an election year, Michigan politicians hoping to be re-elected most likely will not want to be associated with any sort of tax increase, even to fix the road they drive on to get to work. Or maybe they have special smooth roads for politicians. You get what you pay for. Or you don’t get what you don’t pay for, but in the end, you pay for it anyway. Between the bumpy rides in the back seat and no one to take care of him at school when he complained of pink eye – because Michigan politicians also doesn’t want to waste taxpayer dollars on school nurses – my youngest child said he actually wants to move to a state with higher taxes when he grows up. Last night, as I was driving my kids home, my daughter thought she could give me instructions about my driving technique. After all, she has been a driver’s ed student for about 2 1/2 weeks. “Mom, why are you going over so much to the right? It’s because, my dear, that pothole is in the very same place of where the road should be. To avoid one of these potholes, I would have had to cross over a double yellow line into oncoming traffic, or drive straight through the even more potholed and gravelly shoulder. Sometimes, there is no choice but to go through a pothole and just pray you make it to the other side. Every day in the Detroit Metro Area is an adventure. Like last week. I drove myself to the emergency room in the middle of the night thinking I had a kidney stone, leaving my three kids to fend for themselves to get up and out the door for school. This week, it was my car’s health that made for an interesting week. Of course, these are the weeks my husband is on Japan on business. the plane can not jet across the skies fast enough to get him home. Every day, people on the road see me coming because I am not ready to turn in my New York license plates. You see, to save taxpayer dollars, Michiganders do not have plates on the front of their vehicle. So, when you drive a car from New York, especially with the retro Orange and Blue old-style plates that hearken back to the gas guzzlers of the 1970’s you really stand out. 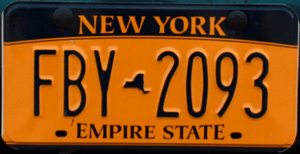 Because drivers can see me coming, the plates compel me to take on the role of an ambassador of the Empire State. And this ambassador is a very courteous driver. I leave intersections and shopping center driveways clear so my fellow drivers can exit and enter. I yield to pedestrians to cross the street, even the ones with canes, and don’t honk at them to hurry up. All this to dispel the myth that all New York drivers are assholes. I took my car in for a routine oil, lube and filter change the other day. It turns out Lube Tech is the kind of speed oil change places, where the work is done in less than 20 minutes. Fair enough, I’ll wait for my car in the tiny waiting room filled with magazines about cars and sports. Then, a swarthy mechanic tells me that my car requires synthetic oil. Which of course is more expensive and I can’t use the coupon. I’ve never used synthetic oil, please use the regular oil, please. Ten minutes go by and the mechanic approaches me with a concerned look. What is he talking about? I just drove my kid to school this morning? Oh this can’t be good. He tries again. I try. One of his associates tries. The key will start the car and turn her off, but won’t come out. And I’m supposed to be PAYING for this? So, now, I’m sitting in my car with a stuck key in the ignition and windows locked shut. I’m a woman in a garage with four guys with my husband across the globe. And I don’t feel like paying for my oil change for some reason. After giving them a piece of my New York mind, I drove off without paying. And I set out to locate my nearest Chevy dealer. Now this would be easy if I could use my GPS. Too bad it is locked in my glove compartment. Locked with the key that won’t come out of my ignition. With a little know how, and recalling how my son taught me how to use Google Maps on my smart phone, I make it to the nearest Chevy dealer. Who reassured me that all is under warranty and they will provide me with a rental car, all paid for by the good people of General Motors. I was hoping to not get a compact car, because on any given day I have to drive at least three kids around town, plus all their stuff. Turns out the only GM car the rental place had available was the biggest “car” there is: A Chevy suburban. The rental agent behind the counter, a woman, asked me if I can handle a vehicle this big. So, for a few days, while my car was being fixed for a problem that had NOTHING to do with the oil change, I felt untouchable on the road. Completely confident on making that Michigan left on Telegraph. Or Woodward. And what’s more, people still saw me coming. Years before I even dreamed that I could live in Detroit, I’d see them on the highway and it would make me wonder. On summer road trips I would often see shiny, shark-fender cars headed west as we headed east. Cars of bygone eras in reds and powdered blue. Some being driven, some being transported on flat beds or in tow. Little did I know back then but they were probably headed to Detroit’s Dream Cruise. I first heard about the Dream Cruise at a lady’s evening out. Being the newbie that I am, when I hear the word cruise, I automatically think – big boat with a midnight buffet. “No, no, this is the CAR CAPITAL! You have to go to the Dream Cruise, it’s like nothing you’ve ever seen, man! They rev up and down Woodward for days! Some even pour some kind of bleach in their tail pipe so when they rev their engine they get a big puff of white smoke. It’s crazy!” Said one woman, a slim attorney who sipped away at her white wine. This is not called the Motor City for nothing. And I’m learning that in Detroit, people take their cars very seriously. Drive around any time of day, in any part of the city, good and bad, and you will see how people take pride in their cars. Me? Well I don’t think I waxed a car since I helped my grandpa wax his Oldsmobile Cutlass in our driveway. Earlier in the summer, as a prelude to the Dream Cruise, I attended an open house at the General Motors Powertrain plant in Pontiac. On display were cars owned by GM employees as well as the Stingray that was used in the Transformers 4 movie. This week, NPR featured a series about the millennial generation and their disenchantment with car ownership. The series spoke of urbanite teens and 20somethings preferring Zip Cars, sharing cars, tweeting to bum a ride, or moving back to cities with public transportation. That’s a big U-turn from the decades past when teens and those in their twenties couldn’t wait to get their first car. When a whole lifestyle was built around the car. Can you think of any songs these days written about a car? But a desire to live one’s life without the love of a set of wheels? Last week, millions came to Detroit from all over the country in their roadsters to cruise up and down Woodward Avenue, from downtown Detroit all the way up to Pontiac. Then there are the crowds who come to just WATCH CARS. All week. They bring their lawn chairs and sit on the curb with family and friends. Some take this to the heights of tailgating, complete with tents, hibachis and picnics. Do these people care about the carbon dioxide they emit from their gas guzzling vehicles? Or the price of a gallon of petrol these days? Did you build that yourself? And the traffic is crawling along so slowly, proud drivers are actually able to give answers to the spectators. They are more than happy to brag about their baby. Overall, Dream Cruise was a beautiful night and we had a great time. But I couldn’t help but think: these people are willingly – willingly – sitting in traffic. For hours. To show off their chrome exteriors and leather interiors. To breathe in all those fumes. To come together and show off the best of what Detroit has to offer, cars built in the glory years of the American automotive industry. I spend a lot more time in my car now that I’ve moved to Detroit. No longer are the places I need to get to the most under 5 miles away. No longer is anything just a short ride away. I don’t care if I had the most souped-up ride in my garage. in my spare time, even in the Motor City, the last place I want to be in, is in a car. Thank goodness for Thanksgiving. The long weekend affords most of us a breather from modern life’s breakneck pace. We pause to focus on coming together with family and friends, preparing a meal, tossing a football and sleeping late in your own bed. But, if you are like my family – transplants – Thanksgiving means hitting the road. Or, heaven forbid, the airports. That is the only way the family-coming-together aspect of the holiday happens for us. In our case, traveling is not as idyllic as over the river and through the woods. It’s more like Down the Thruway and over the Outerbridge Crossing to Staten Island We Go. Where there are hardly any woods left to go through. 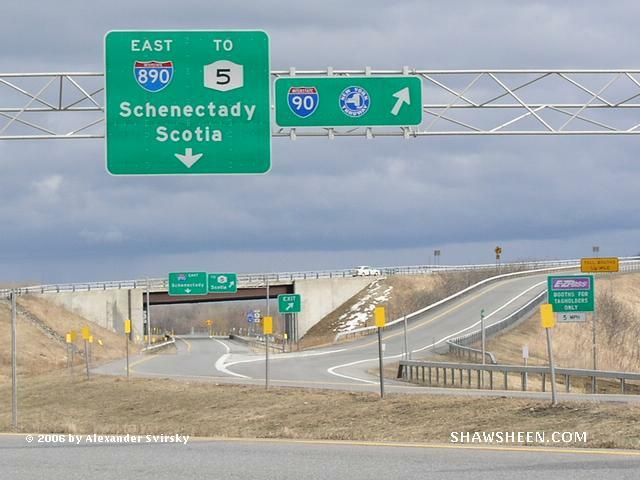 And on Thanksgiving, just as the larger planet pulls on its smaller orbiting moons, down the Thruway we go. One especially hectic year, we stayed in Rochester for Thanksgiving. The weather was beautiful – warm even — and we spent a relaxing weekend feasting and playing into the evening at the Brighton Town Hall playground. I prepared perhaps the only Thanksgiving feast I will ever make. I made the turkey on the barbecue. I made a chestnut stuffing ala Martha Stewart. Everything tasted delicious. But the lonely looks on my childrens’ faces taught me a lesson: Thanksgiving tables are too empty without grandparents, aunts, uncles and cousins. I am thankful that cries for Sippy cup refills and diaper changes have been replaced by three contented souls in the back who can pass snacks to each other, operate the remote to the car DVD player, and participate in family sing downs and games of 20 Questions. I am thankful for every rest stop we have discovered between here and there, especially to kind workers who have supplied us with buckets, hoses and slop sinks for carsickness cleanups. Really, if you do have a kid that gets sick in the car, find a truck stop like the Flying J Travel Plazas that have showers and washing machines. The folks there are all too kind to help you in your distress. I am thankful that we finally come “home,” we have relatives who bound down steps and out into driveways to greet us, no matter the lateness of the hour. DO strap everything down very carefully. On our first trip back to Rochester, on a windy, windy passage of Route 78 in New Jersey, our Peg Perego Stroller came loose and flew off our roof rack. One minute, there it was, and then it was on the side of the road, thankfully killing or injuring no one in its catapulted flight. If you are traveling with very young children that might become carsick, but may not alert you at the most opportune time that they will become carsick, DO pack a puke kit. This kit includes a roll of paper towels, a bottle of Lysol all-purpose liquid cleaner, and a change of clothes that is easily accessible. If traveling with those same small children, DO invest in one of those Art Cart on the Go Tables that can be placed over a child’s lap. The Art Cart has legs that double as side pockets that keep paper, crayons and markers handy. Or, in the worst case scenario, those pockets also can come to the aid of the carsick child. I speak from experience. For a meal break, DO stop in Scranton or Dickson City, Pa. It is exit 191 A or B on Route 81. Home of The Office, it is a great little town to stop for meals. If we hit Scranton for lunch or dinner, we eat at Tonalteca. The place is clean, the decor features hand crafted carved booths from Mexican artisans, and there are plenty of choices for vegetarians. The guacamole is outstanding. And, for those of you who get stir crazy in the car, they play great salsa music in the bathroom. If they have the security camera going by the sinks in the ladies room, they might have footage of me doing some salsa steps I learned in Zumba for all I know. Anything to work off that guacamole. DON’T stop in the Poconos for any reason. There really is no place to stop. The gas stations for bathrooms have nothing more than outhouses or bathrooms around back that you have to carry in those huge keys for admittance. And, if you see a billboard for The Cheesecake Factory, don’t believe it. No, it isn’t The Cheesecake Factory, the upscale eatery. It’s just – a cheesecake factory. So, unless you want to sit in your car with your family consuming a cheesecake for a meal, ignore the sign and keep driving. DO find the small village of Whitney Point along Route 81 and stop at Aiellos Italian Restaurant for the best pizza you can find in Western NY. And I am not saying this is good pizza for Western New York. I mean, this is thin-crust Brooklyn Pizza that somehow found its way to Western New York. And, the quaint restaurant in the back will be decked in its Christmas decorations this time of year. You won’t want to miss out on this. DON’T be anywhere near Binghamton or Syracuse on Sunday afternoon if you can at all avoid it: college kids coming back from Thanksgiving break. DON’T go over the George Washington Bridge or traverse the Cross Bronx Expressway. Ever. Safe travels to you and a very happy Thanksgiving. I love watching the Olympics, especially when our country is competing. I just love shouting USA! USA! from the comfort of my living room when our athletes come out on top. Aside from our elite Olympians, our population as a whole is in no way in contention for winning a gold medal when it comes to our walking habits. A recent study by the University of Tennessee was covered by ABC and said that only 8 percent of all errands and daily routines in the US are done by walking. The average Japanese citizen takes 7,168 steps a day. Australians take 9,695 steps per day. And for the average American sloth who has become accustomed to drive-ins for fast food, coffee, and pharmacy pick ups? We only walk an average of 5,117 steps a day. Not much to cheer about. This week, my town, as part of its green initiative, sponsored Curb Your Car Week. ColorBrightonGreen.org, a non-profit organization that educates residents and businesses on global climate change, this week sponsored Curb Your Car Week Oct. 3-9. Brighton residents and others in the area were encouraged to register at www.colorbrightongreen.org and pledge a few days – or a whole week – to driving less. If you didn’t register yet, it’s not too late! Log in and register any time this week you did not take your car to run an errand or walk to work or school. Last spring, 184 Brighton and Rochester residents participated in the same event and logged in the miles that they walked, biked, bussed or carpooled. The results: participants saved 3,819 pounds of greenhouse gas emissions from spewing into the air. Now I know, I am spoiled. All my kids either walk or take the bus to school. I know most of you have a hellish commute from the suburbs to the downtown of wherever you live. I live only seven- tenths of a mile from my job teaching preschoolers. If I am organized in the morning, I can get out the door on time to enjoy a healthy walk through a beautiful neighborhood that backs into a wooded grove and a reservoir. Even when it’s not Curb Your Car Week, I like to hoof it to work. So I thought it was no skin off my back when I made the pledge to walk or bike this week for at least three days. But it’s not easy being green. The toughest part switching from my car to my feet is coordination. I mean, I admit: I’m not much of an athlete, but I can put one foot in front of the other. But then, there’s the stuff that accompanies all of us to work. We want our coffee cups. If I’m walking I have to have my iPod. And I don’t know about you, but I seldomly go to work empty-handed. I am usually lugging many books and art materials back and forth to work. And teachers take strange, cumbersome things to school -especially preschool – that don’t make for an easy stroll. For example, I didn’t walk to work today because carrying a small wash basin that I would later use in the morning for a science/art project did not seem like my idea of a good time. So far this week, I walked to work twice. When I signed up for Curb Your Car Week, the sun shone and the skies were blue. And this week, well, it rained so much the week should have been called Curb your Ark Week. But I did not lose my resolve. I donned a raincoat and found my umbrella. I dug my rainboots out of the closet and headed out into the cool air. And while I walked, I really was working and working out. I gathered fallen leaves and acorns for an art project. I thought about what toys I would put out while I blasted Viva la Vida into my ears. I had time to pet the yellow lab who waits for me in his driveway. I had time to process and transition between home and work. And when I got to work, I was a little wet, but relaxed, happy and energized. Come on, America, let’s show the Australians and Japanese who is still No. 1! If you want to boost your health and that of the planet’s, take your own Curb Your Car challenge and pledge to drive less. Take that walk to the bank or the library or the Starbucks and say hi to some neighbors on the way. Until the snows come to Rochester, even after this week, I will be walking uphill to work. Both ways.